Bay Path Lodge, of West Brookfield, celebrated its 75th Anniversary, on September. 11, 1999. M. W. Fred K. Bauer. 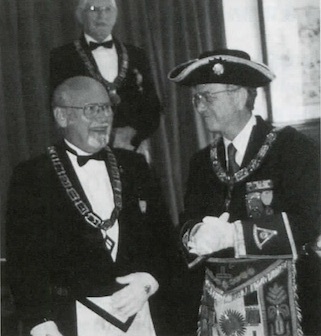 Grand Master, presented Wor. George Valerius with the Joseph Warren Distinguished Service Medal. The Grand Master also unveiled a Commemorative Plaque. Wor. Harry Allen, Master, hosted a gala reception and dinner at the Masonic Home in Charlton following the event. Wor. George Valerius and M. W. Fred Kirby Bauer. Grand Master. M. W. Fred Kirby Bauer. 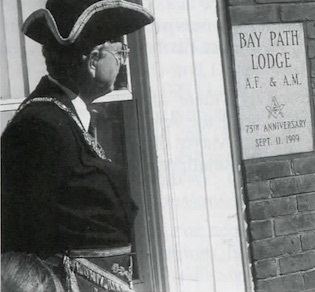 Grand Master, viewing recently installed commemorative plaque celebrating the seventy-fifth birthday of Bay Path Lodge.